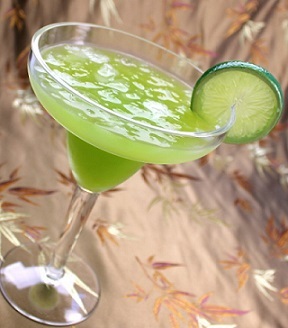 This Midori Margarita Recipe is a refreshing blend of tequila, Midori (a melon liqueur) and sweet and sour mix. You can serve it "blended" or "on the rocks." 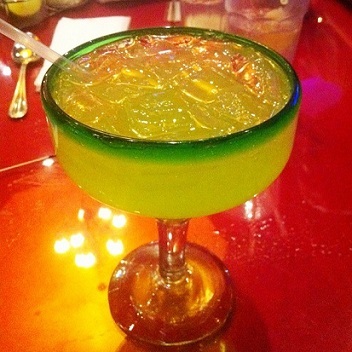 This is a green colored drink and looks beautiful in a stemmed glass. Stemmed glasses are great fun! Midori is a bright green, sweet honeydew melon-flavored liqueur. It’s refreshing melon taste is used in world famous cocktails such as this Midori Margarita and Melonballs (vodka, pineapple juice and Midori). Preparation time: 1 minute. Serves 2-3 or double the recipe to serve 4-6. Note: Those are the "standard" ingredients but I use half sweet and sour mix and half Rose's lime juice with a dash of sugar. To serve Blended: Place all ingredients in a blender, toss in a cup of ice and blend for 30-40 seconds. To serve on the rocks: Combine ingredients in a pitcher and pour over ice in a stemmed cocktail glass. There are more restaurant drink recipes on the website and more recipes are added frequently. Please see Keep Up-Dated for directions on how to very easily and efficiently monitor additions and improvements to the website. Enjoy your drink recipe and the company of those you share it with! "In Florida they salt margaritas – not sidewalks."